The Keto diet is undoubtedly one of the most effective ways of bringing about meaningful long-term weight loss, with a corresponding improvement in your overall health. However, nobody ever said following it was easy. There are multiple challenges I encountered day after day, a major one being ensuring my protein requirements were met. While the ketogenic diet is restrictive of carbohydrates, it does advocate for a reasonable intake of protein, which for many people, can be hard to obtain unless you supplement with a good protein powder. It took a little bit of trial and error on my part, but I believe that I’ve garnered enough experience to save you the trouble of wading through dozens of subpar protein powders. A mistake I made early on, and one I see people making every single day is the belief that the keto diet equates to a low-calorie, starvation way of achieving weight loss. This is not the way it should be since at best, there should only be a small degree of caloric restriction, with the rest of caloric allotment fulfilled by protein and beneficial fats. In particular, protein can make or break many diets, and physiques in the process. It can be motivating to see the initial weight loss that comes about from carbohydrate restriction, but after a while, it inevitably becomes harder and harder to lose more. This was an issue I faced, since as it turns out I wasn’t getting enough protein in my diet. But why exactly does protein help with weight loss? This is due to the thermic effect of the macronutrient, which for protein-based foods is significant. The thermic effect of food refers to the number of calories necessary for it to be processed completely, or metabolized by the body. For proteins, the amount of calories it takes to process them is between 20-35% of the calorie value, so if you consume 1000 calories from a protein source, you use between 200-350 calories just processing it! This is massive, and is why I was pleasantly surprised to learn this, and am sure you are too. Get your protein in kids! This wasn’t my first go-around with low carb diets. I had, in fact, tried them multiple times in the past, but have failed mere weeks after starting, as low-carb cravings are immense. Coupled with the fact that if you are restricting calories too far, you will always feel hungry while on a diet, at least until you increase your protein intake. Protein is one of the most satisfying macronutrients, which studies have found that when increased from 15% to 30% of daily calories, subjects consumed fewer calories without even realizing it. On average, 440 fewer calories were consumed by subjects in the study, which could easily help you reach your calorie target for the day. During the first week or two when starting the diet, I experienced brain fogs and poor concentration that made it difficult to work efficiently. This will pass after about 2 weeks when you get fully into ketosis. But it can be tough to deal with if your job requires high mental fortitude throughout, and you can’t afford to “wait” it out. Even though carbohydrates play an important regulative role in the levels of important brain chemicals, or neurotransmitters, ensuring that you keep protein intake high is critical to helping with the production of them. Neurotransmitters are synthesized from amino acids, with a deficiency strongly linked to depression or lack of motivation and drive. I absolutely noticed that my overall mood corresponded with protein intake, so ensuring my daily consumption remains high is a key objective of mine. Arguably, one of the main reasons for increasing protein intake is to support muscle growth and hypertrophy, which in addition to helping make you look better, also directly contributes to your metabolism. Within muscle cells are mitochondria, specialized units that burn calories and produce energy for the body. The goal of an effective workout plan is to stimulate muscle growth, making the mitochondria more efficient at burning calories and promoting weight loss almost on autopilot. I advise weight lifting, coupled with the keto diet and a moderate protein intake for dramatic changes to your body composition. How Much Protein Should I Be Consuming Per Day? Your requirements for protein are likely to be different than mine, based primarily on your bodyweight, and secondarily on how active you are. For most people with an average activity level, consuming between 0.5-1g of protein for every pound of body weight is sufficient to prevent muscle breakdown and ensure that muscle growth is unhindered. The rest of your daily calories should come from fats, which makes meat the ideal source of protein (as they naturally contain fat as well). However, not all meats are the same, which also explains why there is such diversity with protein supplements. Even though getting more protein in your diet is now a no-brainer, there are still other considerations to be made. One of these major considerations is the type of protein supplement you will use, as they are not all the same. When I first started the Keto diet, I experimented with a variety of protein types. While there is a place for each one based on individual differences, there are some that are consumed far more often than others. 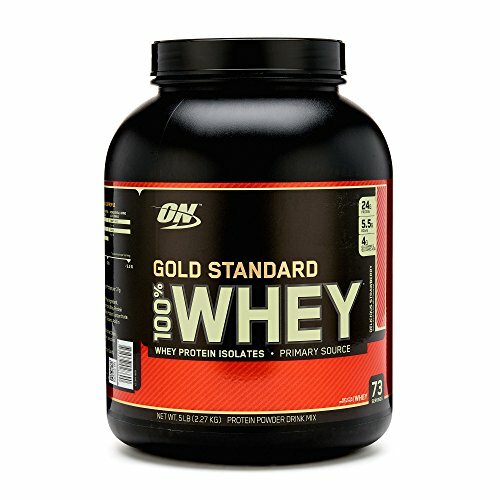 Considered the gold standard by many, whey is the most widely available commercial protein powder. Even though whey can be considered dairy based, it is important to realize that the actual lactose content of it is very low. This is important for people that are lactose intolerant (like me), as whey and lactose are fundamentally two very different things. Whey protein is fast digesting and hits the bloodstream in a short amount of time, making it ideal for use around the workout window. Whey comes in different forms as well, such as the concentrate (which contains more unwanted stuff- think of fat and more lactose), isolate (the most commonly consumed variety) and hydrolysate (newer development, enters blood much faster). Another dairy-based protein extracted simultaneously with whey, and usually in greater concentrations. Even though they share so much, casein is not the same as whey. For one, I typically use it before bed and mid-morning due to its much slower absorption. Casein, unlike whey, forms a gel-like mass when exposed to gastric acid and water, which then slowly liberates amino acids for absorption into the blood over many hours. Again, contains some amount of lactose so tread lightly if you are sensitive. Collagen proteins are one of the most underrated sources around, even though our bodies are made up of over 30% of this type of protein, being found in joints, to an extent in bone tissue, and many organ systems. Collagen brings a unique perspective to proteins. In addition to promoting muscle growth, it also supports the health of the numerous connective tissue types our bodies possess, such as skin, nails, hair, and joints to name a few. If you’ve never consumed a collagen protein before, doing so is likely to make you appreciate this protein in an entirely different light. Start off by making home-made bone broth soup which is one of the best sources of dietary collagen you can get on the cheap. It’s no surprise that most of the commercially available protein powder supplements are animal based in some form or the other. It is tough for vegans or vegetarians to meet their protein requirements. Berry protein such as goji. Vegan proteins tend to contain artificial sweeteners such as Stevia to make them palatable, as the removal of the carbohydrates during the production of the powder could make them taste like sawdust (I had unflavored soy protein a couple times in my life, yuck!). Egg white protein has been around for an extremely long time and is likely what the bodybuilders of yesteryear consumed. Egg white is an extremely lean protein powder, as it contains virtually no fat and is also unique in the sense that it contains more BCAAs (branched chain amino acids) that many other protein types. Whole egg protein powder is apparently now a thing as well and is likely to be better suited to the keto diet since it has an ample amount of fats in it. Beef protein, on the other hand, is an excellent substitute for people that can’t use whey or casein, as it contains a rich amino acid spectrum, and is fortified with collagen for extra support. For the most part, people consuming protein powder supplements never experience any adverse effects. But there are a small proportion of users that will, unfortunately, have less than ideal experiences. Stomach upset from consumption of products that contain MCT oil. Being a fat-based ingredient, diarrhea or muscle cramps have also been reported. Insulin spikes from over-consumption of whey protein. Whey can also be converted into glucose within the body if needed (as do other kinds of protein), so it is important to combine whey with fats to blunt this effect. Allergies to various amino acids that make up a particular protein. Persons may have allergies to egg protein, but not to the shell (such as eggshell collagen). What To Look For When Choosing Keto Protein Powders? The first thing to understand when choosing a Keto protein powder is the fact that it does not need to indicate “specially designed for the keto diet”, or something similar. There are just smart manufacturers that include ingredients that boost their reputation for Keto dieters, so kudos to them! As previously mentioned, not all are created the same. In general, try to get your hands on different types if possible. A collagen, whey, casein and egg protein mixture is ideal if you have no allergies. This way, you get the widest amino acid spectrum possible. Though most protein supplements are low-carb, there are additives which may adversely affect insulin response without you knowing. This is similar to the issue caused by diet sodas, which are sugar-free but may still spike your insulin levels and cause problems of their own. In general, you want to choose a product that does not include too much maltodextrin or sodium. Most common keto powders contain at least 10g of protein per serving. This is somewhat low, but the minimum of what you should be striving for. If you lift weights a few times a week, you will need to complement this with whey taken around workouts. Supplements that contain MCT oil are excellent; these have been proven to lend themselves the most to increasing ketone levels. Other proteins such as whole egg protein are other great choices, as they contain a decent amount of fat. Even though I believe this is trivial, there’s nothing worse than purchasing a product only to hate the taste and never ending up using it! This is a waste of money on so many levels, so choose flavored varieties and see how it goes. When you’re on the keto diet, you need to use a protein powder supplement that supports your goals, by being formulated with your specific needs in mind, and one that won’t sabotage your progress. 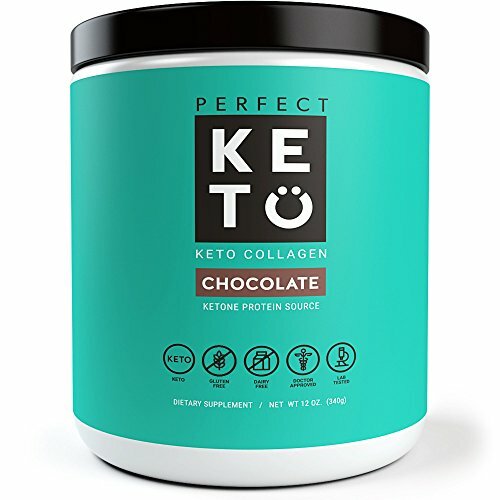 Perfect Keto’s Collagen Protein is one of the most popular supplements for people following the keto diet. It is also the one I routinely have in my supplement cabinet as well. It consists of collagen protein, made from 100% grass-fed cows, packaged and formulated in the USA. It is gluten and dairy free, which makes it ideal for a large number of people (yay! Me), and can help to support your muscle protein synthesis needs, as well as overall health and wellness. I personally opt for the chocolate flavor, as its rich cocoa taste is to die for! I’ve also seen Vanilla and Salted Caramel, though I’m not in a rush to try them. But you may think that’s enough about Perfect Keto’s Collagen Protein right? Nope, not close. Each serving on the powder contains 5g of MCT oil powder in it, MCT being a key fat that converts into ketone bodies and helps you achieve a state of ketosis. Includes MCT oil which is a premium fat source for production of ketone bodies. Suitable for persons with gluten or dairy sensitivities. Helps you enter and maintain the state of ketosis. Small container size means you will likely be picky about how often you consume it. Can be considered expensive when compared to more common types of protein (such as whey). Kiss My Keto protein powder is another exciting option if you’re just looking to mix things up, even though for the most part it is similar to Perfect Keto’s protein powder. It relies primarily on collagen for its protein content, which as I mentioned previously, is a great option and can be considered superior to whey in many aspects (except the price!). Added to that is the addition of MCT oil, which is converted into ketone bodies by the liver. It can be used as a keto meal replacement, coffee creamer or stand-alone shake, though I don’t think it would be sufficient to curb hunger if used as a meal replacement. But if you are looking for a protein supplement to add to your keto diet, this protein powder is second to none. Made from grass-fed bovine collagen that has not been fed hormones, manufactured in the USA. Mixes well in both hot and cold beverages. Can run you into expensive territory if you don’t monitor daily consumption. Not carb-free, even though it contains just 1g. 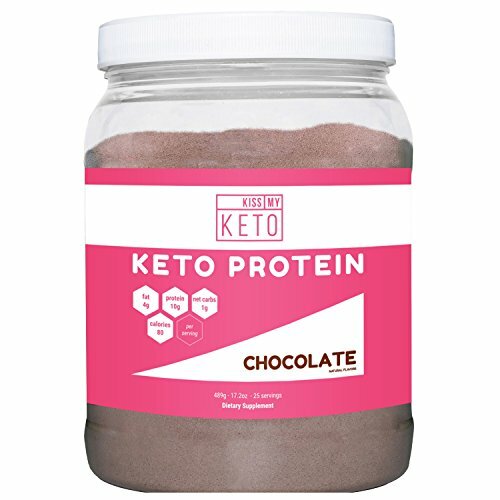 I have had the privilege of consuming one jar of this keto protein powder, and what I can tell you is that they are sure proud of their product. 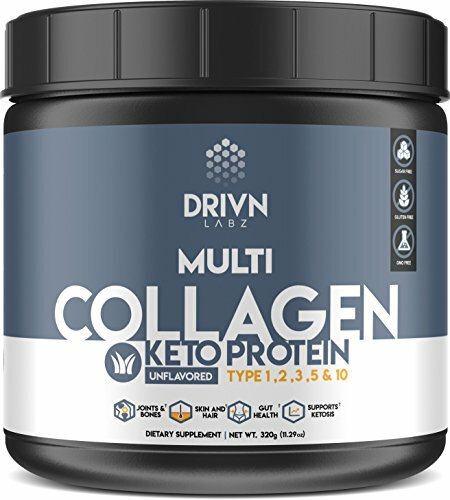 While this supplement contains the staple 10 g of collagen protein per serving, it also contains 5 g worth of MCT oil powder to support you in attaining a ketogenic state. What makes this protein powder better than many others, however, is the fact that it utilizes collagen protein from multiple sources, including eggshells and fish. Studies have found that fish collagen even improves insulin sensitivity of type II diabetic rats, which means it likely holds some amount of promise in humans. The mix combination of collagen sources is seemingly superior to purely bovine protein supplements. Likely to offer greater benefit seated with collagen consumption. Contains 5 g of MCT oil per serving, which ranks it right up there with the best of them. Gluten, soy, and GMO-free, produced in cGMP facility in the United States. Priced competitively with other products. May not be suitable for persons with shellfish or egg allergies. The product is very new and is yet to make a sizable dent in the keto market. I tested on flavored variety (not sure if you have flavored kinds) and it required blending with other flavoring agents to be palatable. Try it in your morning bulletproof coffee for best results. 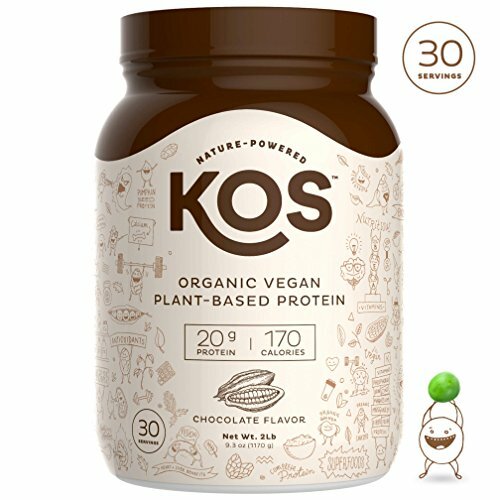 If you are a vegan or vegetarian, this is one of the best protein powders you can get your hands on a keto diet. However, I should let you know this product has a fear amount of carbohydrates, coming in at 9 g.
You should keep track of your net carbs if you decide to go with this protein powder. Of course, the keto diet doesn’t mean 0 g carbohydrates but typically restricted to 50 g or less daily. This vegan protein powder is a blend, being sourced from pumpkin seeds, quinoa, flaxseed, pea and Chia seeds so that you get a wide spectrum of amino acids in every serving. Contains 20 g of proteins per serving, more than the typical collagen based supplement. Contains digestive enzymes that make absorption easier. Made of organic and non-GMO ingredients. Also dairy, gluten and soy free. Best used around your work out when carbohydrates when carbohydrates can quickly be burnt as fuel. Taste is not the best. If you’re serious about the Keto diet, you need to ensure that you are getting enough fat. Fat is arguably more important than protein, but the importance of either should not be overlooked. This is why this product by Julian Bakery is such a breath of fresh air. 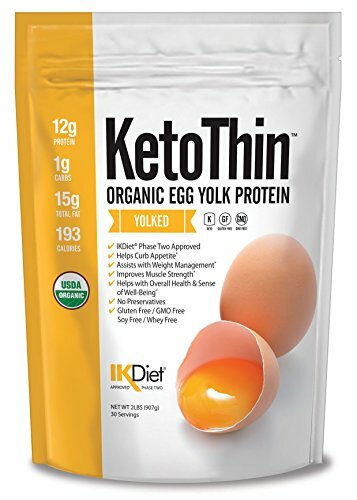 Yes, there are tons of products out there with MCT oil and collagen proteins, but this powder contains egg protein (yes, the yolk and whites), along with its associated fat. Egg yolks are a source of superior nutrition in many ways, eggs being considered complete proteins. Adding egg protein to your daily sources of protein is also excellent for helping to support anabolism and muscle growth, as cholesterol found in eggs supports testosterone production. Gluten, whey and soy free, as well as non-GMO. Unflavored; taste is less than desirable according to past consumers. Not the most popular protein for keto. There’s no replacing whey protein on any diet (unless you absolutely can’t use whey!). When it comes to Optimum Nutrition’s Whey (ON for short) this is likely the one protein source everyone has used at some point or the other. To this day ON whey remains my go-to protein supplement, though I have modified the way I use it today, compared with years ago. Whey is a fast digesting protein that is best suited to use around your workouts, or immediately upon waking in the morning. On the keto diet, it is important to control insulin spikes, as it can impair ketosis and burning of fat. ON whey also contains amongst the highest serving of protein per scoop on the market, coming in with 24g. It also contains a tiny amount of carbohydrates, which is another reason why you should use it at times when the body is most forgiving. Priced extremely competitively. If the cost of collagen proteins limit you, just consume one scoop of that daily, and top up with ON whey at strategic intervals. Available in numerous delicious flavors. Mixes easily in hot or cold water. Contains over 5g BCAAs per serving to support muscle synthesis. Best suited for use around workouts, as whey protein can have an insulinogenic effect. Recent reformulation has led to customer dissatisfaction with certain flavors. There’s no doubting the fact that protein is important while on a keto diet, but there’s a big caveat; don’t overdo. Overconsumption of protein can actually decrease ketone levels since protein can convert to carbohydrates when in excess. Stick to our recommendations above, and you should be on your way to the body of your dreams!